Sya, centre historique de Bobo-Dioulasso is part of the Tentative list of Burkina Faso in order to qualify for inclusion in the World Heritage List. In November 2017, I spent a few days in Bobo-Dioulasso, Burkina Faso's second largest city, but much more appealing for a tourist than Ouagadougou, the enchantingly named capital. The most vibrant area is around the Grand Marché, the atmospheric market, where all the typical foodstuffs, colorful textiles and household goods are on offer; stranger fare was available on the outskirts in the fetish section. 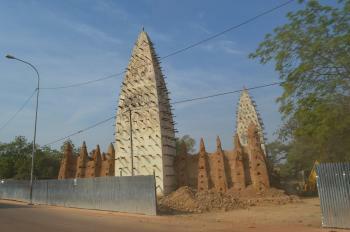 Bobo-Dioulasso’s highlight is the Grand Mosquée, made of mud with timber struts that peek through the plaster. I stayed at Villa Rose, where the Dutch owner was very helpful (in fact, she called me after I made my booking to see if she could answer any questions or provide any information on traveling in Burkina Faso) — plus the room, food, WiFi and outdoor space were great. On the drive from Bobo to Ouagadougou, I stopped at the sacred crocodile lakes at Sabou and Bazoule. Visited March 2014. Sya is in fact the group of mud-brick buildings located in the so called historic centre of Bobo Diulasso town, the oldest of which is considered to be from XI century (as the plate on one building states - but that is probably a local joke). It is relatively small (around 50 structures, mainly old houses) - the most interesting of them looks to be the building in the center (this is equipped with a plate describing it as the oldest in Sya) and XIX century mosque built of clay. There is an entrance fee to Sya (1000 CFA) but they will try to force you to take a guide (unnecessary as the whole stroll will not take long). 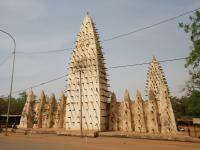 The mosque itself is regarded to be the bigest example of Sudano-Sahelian architecture in the whole coutry.